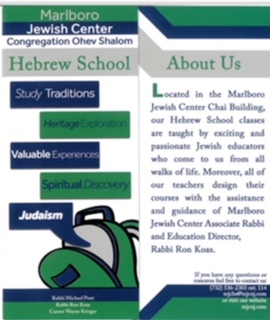 We welcome you and your children to the Marlboro Jewish Center Hebrew School. We are delighted that you have given us the opportunity to partner with you in the venture of Veshinantam Levanecha, teaching (Torah) diligently to your children. With great enthusiasm and humility, we enter this brit, this covenant of bringing Jewish learning more fully into your lives and the lives of your children. We are firmly committed to the creation of a warm, respectful and safe environment in which we can learn and grow together as a community. We all must see ourselves as responsible to ensure that Marlboro Jewish Center is a place that gives life to the values that we learn in Torah, Kavod (respect), Rachamim (compassion) and Chesed (kindness). Our program begins with children of the Kindergarten and extends all the way through High Hebrew High, grade 12. We pride ourselves on a creative, experienced staff whose love of Judaism is shown in every class throughout the year. We have a hands-on curriculum that reflects current teaching styles and classroom management skills. I can be reached at (732)536-2303 or via email at mjchs@mjcnj.com. Hebrew school students are expected to show respect for their teachers and fellow classmates, for learning and the traditions they are studying and to understand the behavior that is expected of them. All of our teachers work to create classroom environments that are conducive to learning and safe for students to take the risks necessary for learning and engaging. With the guidance of the Hebrew School Committee, teachers have the discretion to implement natural consequences to match any classroom misbehavior (see below). If, however, students persistently disrupt a class, parents will be held accountable and the Hebrew School Committee will review the students’ suitability for the class. Please review these rules with your child. Both student and parent should sign below to acknowledge receipt and discussion of this behavior policy. • Follow the teacher’s instructions during work time. CONSEQUENCES will be administered after a child is reminded of the class rules more than once. • Phone call to parents; may require immediate pick-up from Hebrew School. understand the above policy and consequences. If you have more than one student in the Hebrew School, a separate form should be submitted for each student.